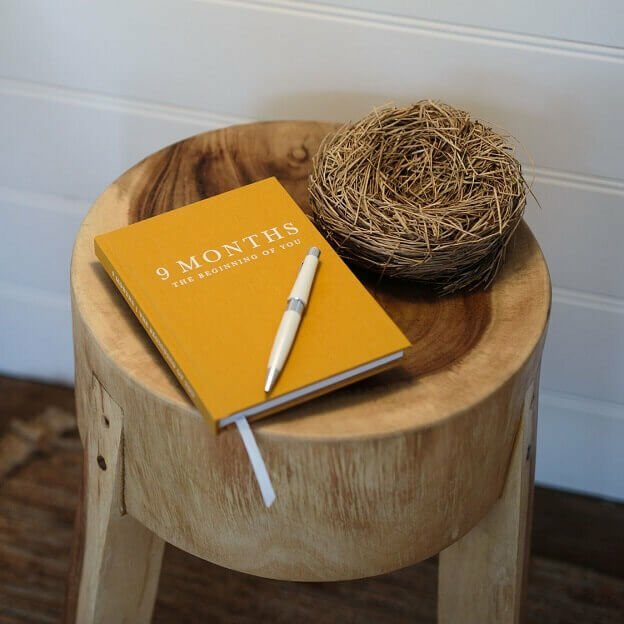 How cute is this Australian designed pregnancy journal, perfect for capturing those thoughts and emotions from conception until birth. Measuring 14 cm x 19 cm x 2 cm perfect to fit into your handbag. It also comes with a beautiful linen hardcover with an embossed spine and title. 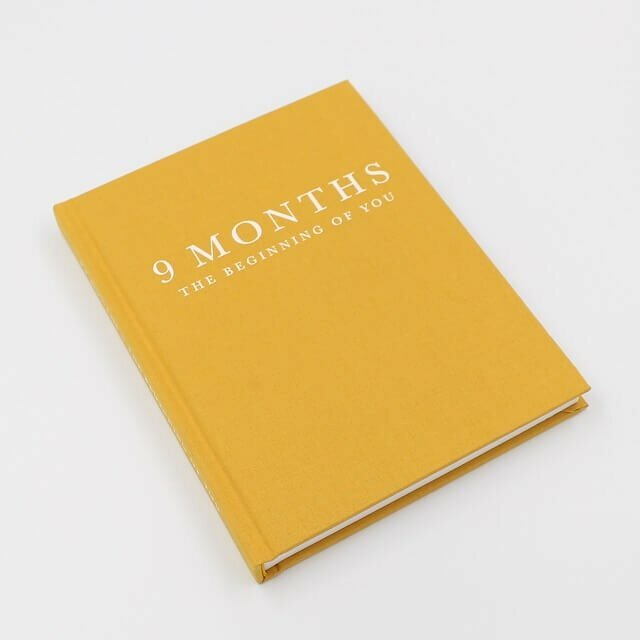 The journal itself is perfect to capture those thoughts and emotions from conception until birth. There are pages at the start to write down your doctors and obstetricians details. There is also an area to jot down any advice or suggested shopping list. Included is an area for adding any name suggestions and books that you might like to read. There is also a little section to add your favourite social media accounts and websites. Hopefully, you will add ours! Nursery plans are a big part of any birth and there is room to write your thoughts on what you would like to include in your nursery. However, probably the biggest plan of any birth is the actual birth itself. There is another segment here to include your thoughts and ideas on what you would like on that life-changing day. When it comes to the pregnancy journal part there is a week by week area to fill in. This is from week 6 through to week 40. Each week you have some suggestions on information to complete. This includes your weight, waist measurements and any cravings you may have. You can also add when your next appointment is and any questions that you may have for your doctor. There are also 2 pages which you can write your thoughts for each week. There is also a place to add a photo each week in the baby journal. The pregnancy journal contains a total of 144 pages on 120gsm stock internal pages and also has a white Ribbon Marker. 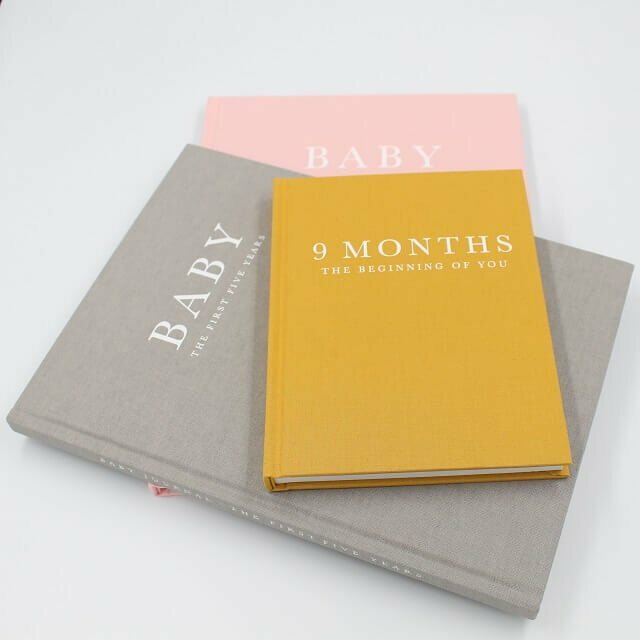 The dimensions of the pregnancy baby journal are 146mm x 190mm x 17mm. Adding photos to the pregnancy diary is a great idea. There is a spare page for every week to add your photo. When doing so we recommend using photos dots, double-sided tape or acid-free washi tape. While you are here and preparing for your birth with your pregnancy journal. Come and explore our range of bibs and burp cloths. These are all handmade here in Australia from designs around the world. Extremely soft and ultra absorbent you will love our beautiful range. 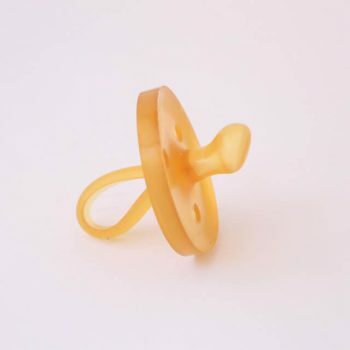 We also offer a range of accessories including the Naturssutten organic natural rubber soother, dummy chains and baby cards. Following the birth, you will want to keep those memories going with our pink baby book for girls for girls. For those having a girl, you won’t want to miss our accessories which include headbands, top knots and baby headbands. 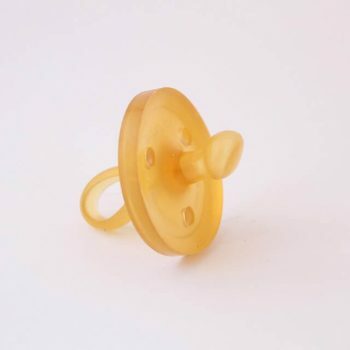 Finally, when the time comes when the little one is teething you will want to have one of our wooden teething toys on hand. So now you have added the pregnancy diary to the cart, keep on shopping for some beautiful handmade items or try the online pregnancy due date calculator.